This coming weekend, I’ll be up on Tyneside with my bike. The weather forecast is horrendous, so I took a look at the Metro web site to see whether I could, in an emergency, take my bike on board a train. I foolishly though that, having recently returned from Berlin, where the local train operator is actively encouraging cyclists onto their trains with their bikes, there might be a chance. Isn’t it about time you woke up to your responsibilities regarding climate change and started to make it easier for cyclists to use the metro system? Having viewed your conditions of carriage, I see that you have a blanket ban on bicycles on metro trains. Compare this with more progressive cities like Berlin, where there is currently a major campaign being run by the local train network to encourage cyclists on to their trains with their bikes. Excuses are now not good enough. We badly need to encourage the use of sustainable transport in our towns and cities. Please reconsider this backward rule, and look at ways in which you can become a partner in finding local solutions to climate change. Any experiences of trying to take your bike on to local trains would be helpful. Went out on the road bike today for a training session. Just leaving Darlington via Branksome area of town, when a group of what can only be called morons (the local chavs) decided to jump out in front of me and block the road with themsevles and their bikes, this left me with no time to stop or find a way around them. Needless to say I ended up on the floor, and needing hospital treatment for concussion, a head injury and a small amount of skin removed from my right leg. Luckly they were not after my bike. However be warned this is happening more and more, I’m also in the Darlo Harriers, and we are getting bricks and bottles thrown at us when out training, this does not just happen in the rougher areas, but increasingly throughout the town. There have been another couple of responses to my letter published in The Northern Echo the other week. * My blog post about the original letter and my reply. * The first reply to my letter, from K Devin. * Today’s reply from Mrs Paddy Dinsdale. There are several points raised in these letters and the campaign is working on a reply. I thought it would be worthwhile posting some points and responses here, as the Echo limits letters to 200 words. It is possible for bikes to give way to pedestrians without dismounting and pushing the bike. As there have been no recorded instances of any accidents between cyclists and pedestrians (other than one which took place on the roadway), I see no reason why cyclists should have to dismount. There have been many accidents involving cars and pedestrians, so why are there not more letters to the Echo demanding slower speed limits across the town? Cyclists in Europe are allowed to cycle in pedestrianised areas. Two members of the Cycle Campaign are visiting one such area in Germany soon, and will post here about it. My point relating to the new design making it much safer for cyclists to use the area was not relating to the safety of cyclists, but to the safety of all users. 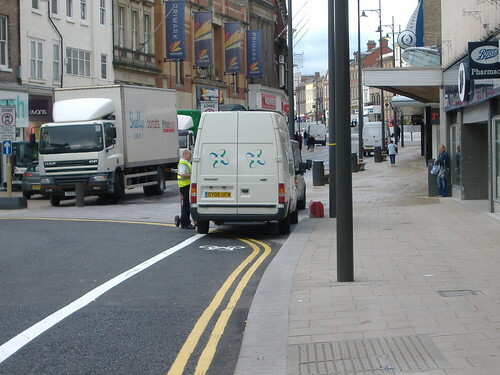 Cyclists used the town centre roads before the pedestrianisation work began without coming into conflict with pedestrians, and the new design makes the area even safer for pedestrians. As has been said many times, banning cyclists from the town centre would force us onto the surrounding ring road. The percieved danger caused having cyclists ride in the pedestrianised must be measured against the very real danger of forcing cyclists onto the ring road. I am very sorry that some people feel unsafe using the town centre, but to ban one group of users because of the irrational fear of another group would be madness. Spectator (June 8) asks “Why should cyclists be allowed in the Heart?”. He omits the crucial adjective. Does he wish to prevent responsible cyclists, simply because one of the many manifestations of youth anti-social behaviour is irresponsible cycling? If so, he should ask himself why the irresponsible behaviour that he saw was permitted, and how it would be prevented if all cyclists were banned. 1. Prior to development of the Pedestrian Heart, cyclists used roads through the town centre to access areas such as the station (via the ring road crossing). 2. There had been 45 accidents to cyclists, including a fatality, on the ring road since 1988, 13 in the five years before the report. 3. There had been no collisions between cyclists and pedestrians on pavements over a four-year period. The only such collision occurred on a road. In that time, there had been 14 accidents involving a private car and pedestrian, 3 accidents involving a taxi and pedestrian, 5 accidents involving a public service vehicle and a pedestrian, one accident involving a police car and a pedestrian, and 2 accidents involving a car and a cycle. During this period there were no recorded accidents involving a cyclist and pedestrian. More recently, in July 2004, a cycle/pedestrian accident had taken place on Northgate – thiswas on the highway. The full report is available for all to study on the Council website. Darlington Cycling Campaign are not aware of any local reasons why Darlington should be an exception to this guidance. Some towns e.g. Cambridge, are currently opening to cyclists previously pedestrian-only areas, others such as Cardiff are considering it. We fully share the resentment of irresponsible cycling. We particularly resent being associated with such behaviour. Furthermore, we do understand the perception that even responsible cycling is dangerous. However, the facts clearly demonstrate that the risk is in truth very low indeed. It is our perception that the behaviour of pedestrians is already changing, and there is a much more relaxed acceptance of responsible cyclists. Spectator may also be heartened to learn that there will soon be cycling policemen in the Pedestrian Heart, as there are in York. Spectator is in error in suggesting that cyclists in York are banned from the pedestrian areas. They are banned only during the times when the areas are exclusively for pedestrian use. These are the same hours that used to prevail in Darlington before the Pedestrian Heart was developed – but cycling was not banned in Darlington during those hours. If cycling in the Pedestrian Heart were to be banned, those who had campaigned for it would have to examine their conscience the next time a cyclist is injured or killed on the ring road. Since these companies are repeat offenders, I’d like to let the internet know that DHL, G4S and Unichem vans park in bike lanes. Specifically, the contraflow bike lane on Northgate in Darlington. Bikes heading north out of town have to cross into the one way traffic coming the other way, risking being hit by busses. This photo was taken a while ago. This morning was the same, but with a DHL van and G4S van parked further down the bike lane. I’m going to be making some small changes to the website soon. I’ve just made a start at reducing the number of labels we use to tag posts. There were starting to be a lot of labels with only one post, so I’ve deleted most of these (I left ETC, as the Eastern Transport Corridor is likely to become a bigger issue once it’s completed). Ironically, in the process of deleting labels, I’ve created a new one. Post which are considered noteworthy will be labelled as such, to enable them to be found more easily later. I did this after discovering a rant I wrote abut what needs to be done in Darlington, and realising that I’d forgotten all about it: The City That Never Walks. If anyone has a favourite post, let me know and I’ll label it as noteworthy: email me, comment here, or comment on the post itself.